Lassa virus and Marburg virus are two causative agents of viral hemorrhagic fever. Their diagnosis is difficult because patients infected with either pathogen present similar nonspecific symptoms early after infection. Current diagnostic tests are based on detecting viral proteins or nucleic acids in the blood, but these cannot be found during the early stages of disease, before the virus starts replicating in the blood. Using the transcriptional response of the host during infection can lead to earlier diagnoses compared to those of traditional methods. In this study, we use RNA sequencing to obtain a high-resolution view of the in vivo transcriptional dynamics of peripheral blood mononuclear cells (PBMCs) throughout both types of infection. We report a subset of host mRNAs, including heat-shock proteins like HSPA1B, immunoglobulins like IGJ, and cell adhesion molecules like SIGLEC1, whose differences in expression are strong enough to distinguish Lassa infection from Marburg infection in non-human primates. We have validated these infection-specific expression differences by using microarrays on a larger set of samples, and by quantifying the expression of individual genes using RT-PCR. These results suggest that host transcriptional signatures are correlated with specific viral infections, and that they can be used to identify highly pathogenic viruses during the early stages of disease, before standard detection methods become effective. Lassa fever and Marburg fever are acute viral hemorrhagic illnesses. Lassa Fever is caused by the Lassa virus and it is endemic to a large region of West Africa, where 100,000-300,000 cases have been estimated to occur each year . More than 20 cases have been imported to the United States, Canada, United Kingdom and Japan since 1969, when the disease was first recognized [2, 3]. The case fatality rate in hospitalized patients has recently been reported to be 69% . Marburg fever is a viral hemorrhagic illness caused by the Marburg virus. Several outbreaks have been reported in the Democratic Republic of the Congo  and Angola  with case fatality rates approaching 90%. Travelers visiting Uganda have also imported the virus into the Netherlands  and the United States . Both diseases lack effective therapeutics and early diagnostics. Early clinical symptoms of infection are shared between different hemorrhagic fevers, and they resemble those of a flu-like illness: fever, headache, myalgia, sore throat, vomiting, diarrhea and dry cough . During the 2014 West Africa Ebola outbreak, samples from suspected patients were routinely tested to rule out infection by Lassa virus, since both pathogens were present in the region and distinguishing between them was an important part of the differential diagnosis [10, 11]. Current diagnostic tests for Lassa and Marburg fevers include enzyme-linked immunosorbent assays (ELISA) and reverse transcriptase polymerase chain reaction (RT-PCR) [12–14]. Because these methods rely on the direct detection of viral proteins or nucleic acids in the blood, they are not useful during the incubation period of the virus, which happens during the early stages of infection [9, 13]. Additionally, most potential therapies for these pathogens—ribavirin , post-infection vaccination , and stable nucleic acid-lipid particle (SNALP) treatment —work best when administered early. Developing tests that diagnose these infections during the early stages of disease would positively impact survival. One approach for developing more rapid diagnostics involves incorporating the host response to infection as part of the diagnostic assay. During an infection, circulating immune cells are present in high numbers and they respond to distress signals from many different tissues by altering the levels of expression of specific genes. These changes in expression often take place before the virus starts replicating in the blood (viremia) [18, 19] (Figure 1C), which means that they could be used to perform earlier diagnoses than those allowed by traditional methods. To ensure that the predictive power of these changes in expression can distinguish between different causative agents, the host gene expression profiles associated with each type of infection must be determined in advance. Two recent reports have used a host response signature to discriminate symptomatic patients with viral infections from those infected with bacteria [20, 21]. An RT-PCR assay has also been developed and clinically tested . Quantified samples in each virus group. (A) Each circle represents an RNA sample isolated from the peripheral blood mononuclear cells (PBMCs) of a cynomolgus macaque. Grey indicates pre-infection samples, each coming from a different cynomolgus macaque. Blue indicates samples infected with Lassa virus, and red indicates samples infected with Marburg virus. All samples were quantified using microarrays. Samples with a black border were also quantified using RNA sequencing. (B) Diagram of the disease timecourse highlighting the most relevant clinical events, from the appearance of fever 3 days post-infection to the late stage of disease and death (see also Table 1). We have analyzed the transcriptome of PBMCs from non-human primates (cynomolgus macaques) exposed to Lassa virus  and to Marburg virus [Lee et al., manuscript in preparation], and we have found that the circulating immune cells develop a robust antiviral response days before clinical symptoms. In this article, we show that the expression differences in the genes that make up this response can be used to distinguish between Lassa and Marburg infections as early as 3 days after exposure. Animals were exposed to an aerosol dose of 1000 plaque forming units of Lassa  or Marburg virus [Lee et al., manuscript in preparation], as previously described. In these models, animals began to develop a fever around day 3 after exposure to Lassa virus and day 4 after exposure to Marburg virus (Table 1). The onset of viremia took place around day 8 for Lassa and day 4 for Marburg (confirmed by both plaque assay and RT-PCR). The liver enzymes aspartate transaminase (AST) and alanine transaminase (ALT) showed increased levels of concentration in both diseases around day 6. D-dimers started to increase around day 5 for Lassa and day 6 for Marburg. In both types of infection, all of these markers peaked during the late stages of infection (days 9–10). These data confirmed that clinical markers of infection that could be used for diagnosis (e.g. viremia) did not appear in these models until day 4 post-infection. Viremia was measured using RT-PCR in the Lassa group, and RT-PCR and plaque assay in the Marburg group. To determine the transcriptional changes that take place in the circulating immune system in response to a hemorrhagic fever virus infection, we quantified the abundance of mRNAs present in peripheral blood mononuclear cells (PBMCs) of cynomolgus macaques infected with either Lassa or Marburg virus. The samples were obtained before the animals were infected, and at multiple times after infection (see Figure 1A). We selected for polyadenylated transcripts and sequenced 12 RNA samples from each group using Illumina technology. This process generated an average of 46.27 ± 5.92 million reads per sample; 72% of which (33.46 ± 4.33 million) aligned to the M. mulatta (Rhesus macaque) genome—the closest organism to M. fascicularis with an annotated genome. Multiple factors may explain why 28% of reads remained unaligned: an incomplete assembly of the M. mulatta genome and transcriptome, genetic differences between M. mulatta and M. fascicularis, or the appearance of amplification artifacts during the sequencing process. We assessed the expression level of individual mRNAs by counting the number of reads that aligned uniquely to each gene, and then normalizing this number to allow comparisons across all samples. To determine the amount of sequencing reads that came from each virus, we aligned the reads to the Lassa virus and Marburg virus genomes. In the Lassa infection group, only the samples taken 10 days post-infection (dpi) contained viral reads (less than 20 reads) (Figure 1B). In the Marburg infection group, around 2000 viral reads were seen 5 dpi, and around 80,000 reads 9 dpi (Figure 1C). These numbers suggest that peripheral blood mononuclear cells are early targets for Marburg virus but not for Lassa virus. The number of viral reads found in PBMCs correlates well with the level of viremia, as previously reported for Lassa virus  and Marburg virus [Lee et al., manuscript in preparation]. To identify what transcriptional changes are shared by different hemorrhagic fever virus infections, we identified genes whose levels of expression 1) closely matched in both types of viral challenge, 2) strongly increased or decreased 3 days post-infection (dpi), and 3) increased or sustained this level of expression throughout the remaining time points (5–10 dpi). We labeled this group of genes the common response (Figure 2B). Some of its representative members include transcription factors IRF7 and STAT1, which serve as master regulators of host immunity; pattern recognition receptors DDX58 (RIG-I), IFIH1 (MDA-5) and DHX58 (LGP2), which activate different signaling cascades in the innate immune system; type I interferon-stimulated genes ISG15, ISG20, OAS1, OAS2, OASL, MX1, IFIT1, IFIT2, IFIT3, HERC5, HERC6, IFI6, IFI35, IFI44 and IFI44L, which play a variety of antiviral roles ; and the cytokine CXCL10, which attracts activated T cells  (Additional file 1). Genes showing similar patterns of expression during Lassa virus and Marburg virus infection. Each point represents the level of expression (measured in log10 normalized read counts) of a gene that behaves similarly in both types of infection (increasingly darker shades of blue for Lassa, and red for Marburg). Panel (A) represents the expression of gene IFI44L showing time in the x-axis. Panel (B) condenses the information in (A) and shows additional genes along the x-axis. After identifying the subset of genes that made up the common transcriptional response, we looked for genes that showed unique transcriptional patterns. To do this, we considered genes that 1) showed a statistically significant increase or decrease in their 3 dpi levels of expression for one type of viral infection but not the other, and 2) increased or sustained this difference in expression throughout the later stages of the infection. In the Lassa infection group, we detected several genes with distinctly upregulated expression (Figure 3 and Additional file 1), including SIGLEC1, a cell adhesion molecule expressed by dendritic cells and macrophages [24, 25]; SAMD4, a translational repressor ; and TNK2, a tyrosine kinase implicated in cell spreading and migration . Other genes, like CENPF, ENPP4, and GZMA, a protease responsible for the release of cytotoxic T-cell granules , were significantly downregulated during Lassa infection in comparison to Marburg infection. Gene expression patterns during Lassa or Marburg virus infection. A few representative genes are shown in each panel representing each category: A) housekeeping genes, genes that uniformly increase or decrease their expression 3 days after both infections, B) genes that show unique patterns of expression during Lassa infection, and C) during Marburg infection. The y-axis represents the average fold change in expression when comparing infected and uninfected samples. In the Marburg infection group, we identified a distinct upregulation in the expression of genes encoding heat shock proteins (HSPA1B, HSPA1L and DNAJA1), the antiapoptotic gene BIRC3, and the immunoglobulin genes IGJ, IGLV10-54, among others. 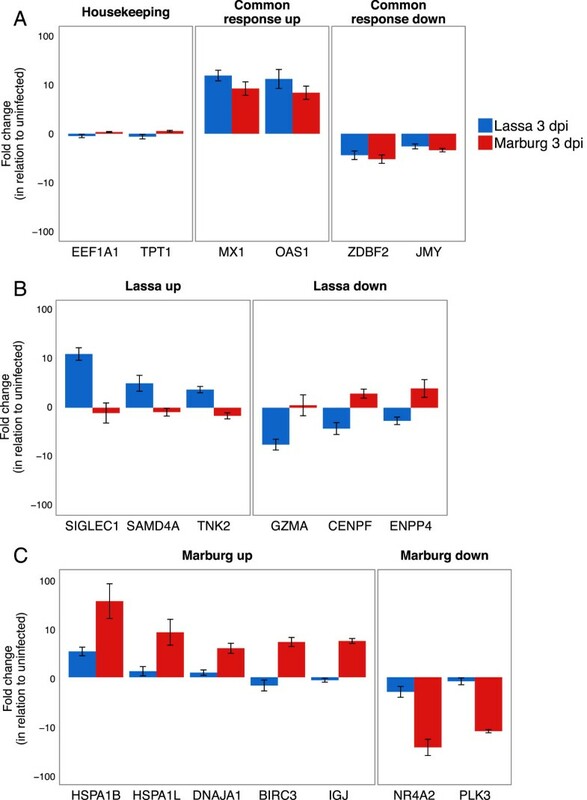 We also found genes that showed lower levels of expression during Marburg infection when compared to Lassa infection. Examples of these include PLK3, a kinase associated with stress response and apoptosis [29, 30]; and NR4A2, a nuclear receptor which has been shown to induce apoptosis when downregulated . The patterns of expression for these and other genes are shown in Additional files 2 and 3. We wanted to know if the genes that showed significant differences in each type of infection could be used to classify unknown samples. Although we were not able to obtain an independent test dataset, we used additional samples from two previous studies to characterize the host transcriptional response to Lassa  and Marburg infection [Lee et al., manuscript in preparation] (Additional files 4 and 5). This dataset included the 24 samples that we measured using RNA sequencing, as well as 26 additional uninfected samples, 12 Lassa-infected samples and 3 Marburg-infected samples (Figure 1A), for a total of 65 samples, all of which were quantified using Agilent two-color human microarrays. We looked at the genes that we had previously identified (using RNA sequencing) as being differentially expressed during one of the two infections, and found that the measurements from both platforms were highly correlated (0.81 Pearson’s correlation). To understand in more detail the differences in expression reported by RNA sequencing and microarrays, we classified a subset of genes into four categories: 1) Housekeeping genes, those that showed high levels of expression across all samples. 2) Common response genes, those where infected samples show higher levels of expression than uninfected samples, and where these levels of expression were similar in both types of infection. 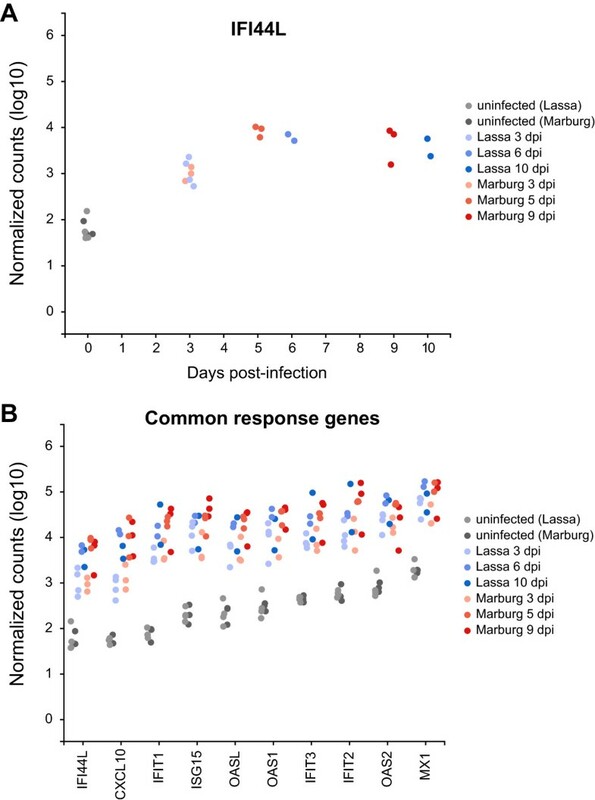 3) Marburg-specific response genes, those where Marburg-infected samples showed significantly higher (or lower) patterns of expression when compared to uninfected or Lassa-infected samples. 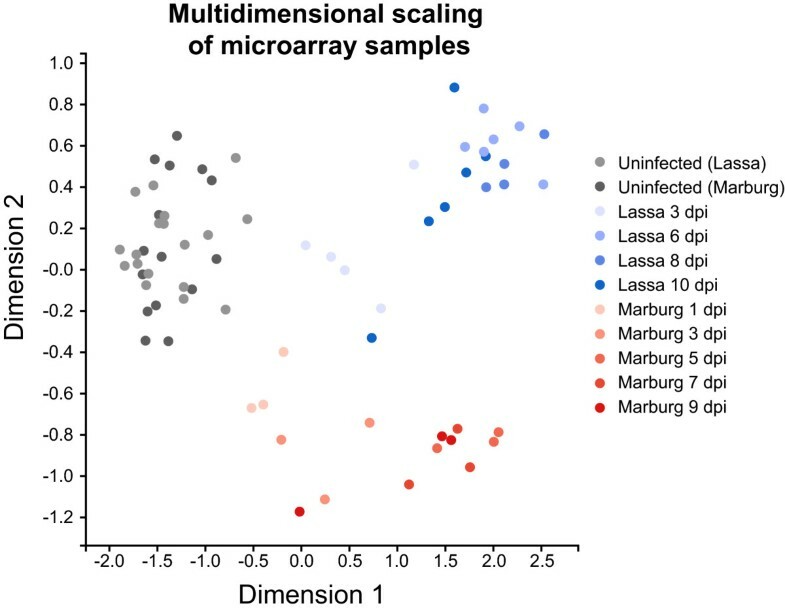 4) Lassa-specific response genes, those where Lassa-infected samples showed significantly higher patterns of expression when compared to uninfected or Marburg-infected samples.To determine if we could use the genes showing unique regulation at early times of infection to distinguish between different types of infected samples, we applied Multidimensional Scaling (MDS)—a dimensionality reduction technique similar to Primary Component Analysis—to the microarray samples. Instead of applying MDS on the expression of every gene, we chose a subset of common response genes, Marburg-specific response genes and Lassa-specific response genes (see Figure 4). Reducing the dimensionality of all samples using these genes resulted in three clear clusters: uninfected samples, infected with Lassa virus, and infected with Marburg virus. Each of the infected clusters contained not only the early-infected samples, but also those samples taken at later stages of infection. This indicates that the expression patterns of these genes are useful indicators throughout both early and late stages of infection.We then looked at the reported expression levels for these genes in both platforms (Figure 5). We only used samples that were quantified in both sequencing and arrays to ensure that differences in variability would only be related to the platform, not to the number of samples. The majority of genes showed similar levels of expression in both platforms. The biggest differences came from genes like HSPA1L and IGJ, which showed much smaller fold changes in arrays than in sequencing. 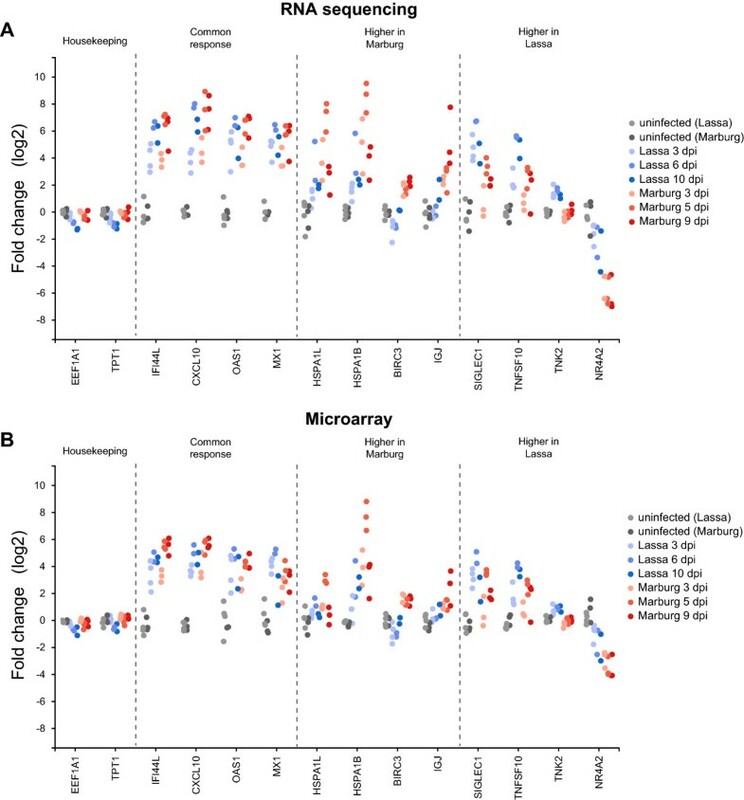 On average, both highly upregulated and downregulated genes showed fold changes with a 1.5-2 times smaller magnitude in arrays when compared to sequencing.This comparison confirmed that both RNA sequencing and microarrays show unique changes in mRNA levels early after infection. This led us to test the hypothesis that a more direct RT-PCR analysis of a small number of these sentinel genes would show similar patterns of unique regulation, with the advantage that the format of this assay could be applied more quickly and cheaply in the field. 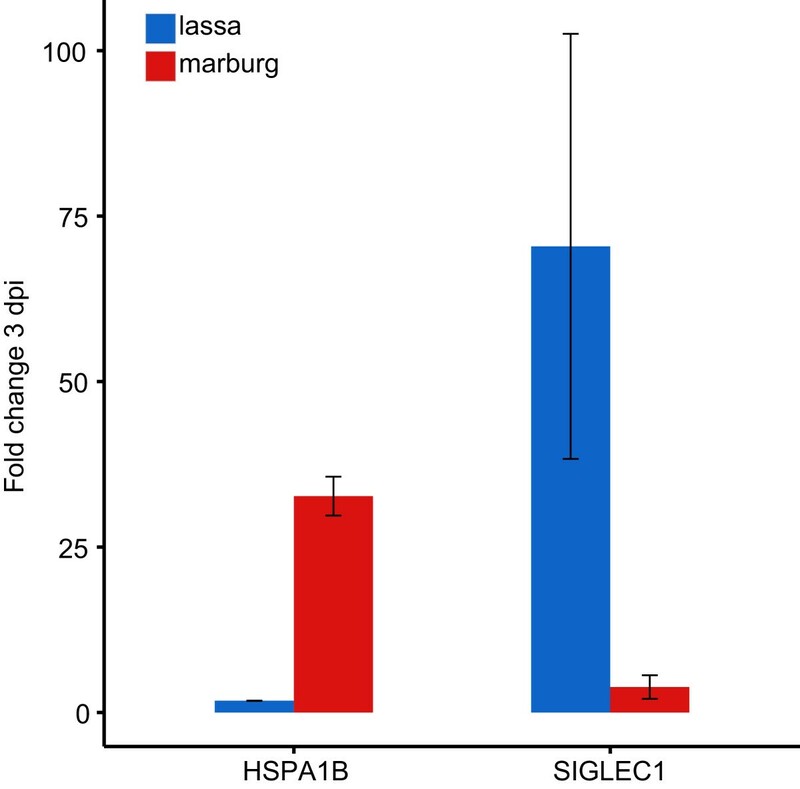 We chose to analyze the expression of two genes, SIGLEC1 and HSPA1B, which showed unique upregulation at early stages of Lassa or Marburg virus infection, respectively. RT-PCR assays carried out on uninfected samples, and on samples collected 3 days post-infection, showed that there was no statistically significant change in SIGLEC1 expression between these two time points in Marburg-infected animals, but that there was a 70-fold change in expression in Lassa-infected animals. Similarly, HSPA1B showed a minor change in Lassa-infected animals, but a 36-fold change in Marburg-infected animals. This confirmed that SIGLEC1 becomes upregulated during the early stages of Lassa infection but not Marburg infection, while HSPA1B is only upregulated during the early stages of Marburg infection (Figure 6). Clustering of microarray samples. Each point corresponds to an RNA sample, and their distances represent how similar they are based on applying Multidimensional Scaling to the microarray expression values of 16 genes: 4 common response genes (MX1, OAS1, IFI44L and CXCL10), 4 Marburg-specific response genes (HSPA1B, IGJ, HSPA1L and BIRC3) and 4 Lassa-specific response genes (SIGLEC1, TNK2, TNFSF10 and NR4A2). Lassa- and Marburg-infected samples are shown in increasingly darker shades of blue and red, respectively. Biomarker genes quantified using RNA sequencing and microarrays. For each gene, the y-axis represents its amount of expression in each RNA sample, and the x-axis represents these samples ordered by time of infection, colored in increasingly darker shades of blue for Lassa, and red for Marburg. The samples in (A) were quantified using RNA sequencing and the fold change represents the log2 difference between the average infected and uninfected normalized read counts. The samples in (B) were measured using two-color microarrays and the fold change represents the log2 ratio between the intensity of the red channel and the green channel (see Methods). 3 dpi RT-PCR validation. SIGLEC1 and HSPA1B are the genes with the highest fold change differences between each virus group 3 days post-infection. The y-axis represents the difference in expression between each gene and the constitutively expressed gene BIN2. The RT-PCR reactions for each gene were performed in duplicate (n = 2). In the work described in this manuscript, we investigated the hypothesis that the circulating immune response can be used to aid early diagnosis of viral infections that are associated with high levels of mortality. When we analyzed the transcriptional patterns of the circulating immune system in response to two different hemorrhagic fever viruses, we identified a subset of genes that uniquely increased their rate of transcription 3 days after infection and that sustained these differences throughout infection (Figure 3). An important aspect of this study was that the uniquely regulated genes were not the only genes that changed their patterns of expression during the early times of infection (before the detection of clinical symptoms), but that many other genes—pattern recognition receptors, interferon-stimulated genes, cytokines, and immune and antiviral transcriptional regulators—also became rapidly upregulated. This suggests that early after infection, there is a strong activation of the type I interferon innate immune response. This early innate response has also been reported for infections with other viruses, such as Ebola , influenza  and respiratory syncytial virus (RSV) , and suggests that the activation of the innate immune system is being driven by a different mechanism. Surprisingly, we did not detect a significant upregulation of type I interferon genes, although we did see it for their downstream effectors. Protein studies indicate that type I interferon is present during Marburg virus infection, suggesting that interferon transcription might be localized to plasmacytoid dendritic cells, which are not strongly represented in the PBMC population . In addition to the common transcriptional changes that we observed at early times of infection, we also identified a number of genes with unique patterns of expression in each type of infection. The unique markers of Marburg infection were generally classifiable into functional categories, including heat-shock proteins (HSPA1B, HSPA1L, DNAJA1) and immunoglobulin-associated genes (IGJ, IGLV10-54). These results suggest that the response to Marburg infection leads to the expansion of both stress adaptive and immunological maturation pathways at very early times of infection. Some of the most uniquely expressed genes during Lassa infection are SIGLEC1 (also known as CD169 or sialoadhesin) and SAMD4A. The upregulation of these genes suggests an increase in SIGLEC1+ SAMD4A + macrophages early in Lassa infection [25, 36]. A more detailed understanding of the mechanisms leading to the unique signatures identified will require further investigation. 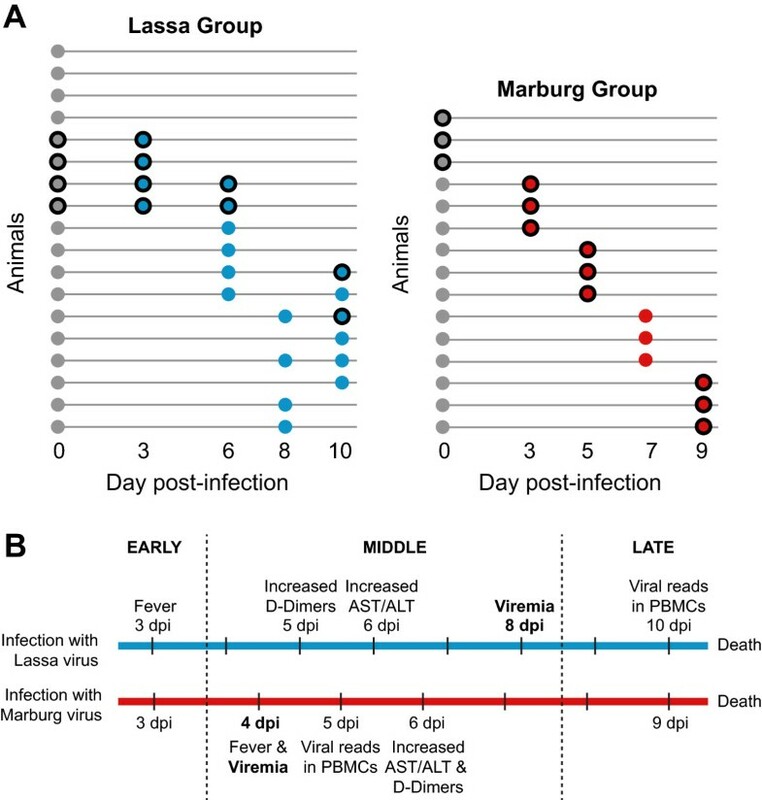 While both Lassa virus and Marburg virus are known to evade antiviral responses by inhibiting the expression of specific host genes [37, 38], it is unlikely that these mechanisms are directly responsible for the expression differences that we found in PBMCs, since they take place during the pre-viremic stages of infection. The specific differences observed take place even in the absence of any viral genetic material in the PBMCs, which suggests that these circulating cells are responding to an external signal. An alternative explanation for the existence of unique signatures might be related to each pathogen’s cell tropism: Marburg virus preferentially targets monocytes, macrophages, dendritic cells and Kupffer cells , and leads to significant lymphocyte apoptosis . Lassa virus targets dendritic cells, Kupffer cells, hepatocytes, adrenal cortical cells and endothelial cells , and is not known to induce lymphocyte decreases. It is possible that a combination of which cells become initially infected and the magnitude of the early response combine to ultimately produce the infection-specific signatures that we observe. We have shown that microarrays can be used to validate the changes in expression that take place in Lassa- and Marburg-infected PBMCs in addition to RNA sequencing. Although the majority of genes that undergo significant early changes in expression were highly correlated in both platforms, microarrays showed a smaller range of gene expression differences between both types of infected samples and greater variability. Three previous studies that analyzed the immune response to Lassa virus infection [18, 42] and LCMV virus infection  were in general agreement with the major trends that we identified using RNA sequencing: mainly the upregulation of interferon-stimulated genes, pattern recognition receptors and pro-inflammatory cytokines. The infection-specific transcriptional changes that we have found suggest a method for discriminating between diseases with similar early clinical symptoms, as is the case for Lassa and Marburg infection. In infected animals, these transcriptional changes take place prior to the appearance of viremia and other overt symptoms , and they remain sustained throughout the late stages of infection, thereby providing a way to diagnose which virus is most likely causing the infection. This diagnosis can be carried out during the early time window when treatment is most effective, and before the pathogen starts replicating in the bloodstream on a massive scale. To ensure that an RT-PCR-based diagnostic would be able to distinguish between diseases other than Lassa and Marburg disease, it would be important to determine the host transcriptional response to additional pathogens like influenza virus, dengue virus or the malaria parasite, which cause similar initial symptoms to those of viral hemorrhagic fevers. The expression of a unique set of host genes increases or decreases preferentially in Lassa- or Marburg-infected immune cells. During Marburg virus infection, heat-shock protein and immunoglobulin genes show significantly greater levels of expression than during Lassa virus infection, which is characterized by the upregulation of the cell adhesion molecule SIGLEC1, the translational repressor SAMD4A and the tyrosine kinase TNK2. These changes in expression appear early after infection and remain sustained throughout the entire course of disease, which provides a way to diagnose which virus is most likely to be causing the infection without having to wait until the appearance of viremia or other overt symptoms. The fact that these changes were identified using multiple platforms (RNA sequencing, microarrays and RT-PCR) suggests a path for translating these gene expression profiles into a diagnostic test with direct clinical applications. The samples used in this study came from a larger sequential sampling study designed to characterize the disease progression of viral hemorrhagic fevers after aerosol exposure [Honko et al., manuscript in preparation]. Animal studies were carried out in accordance with standards of IACUC approved protocol in compliance with the regulations outlined in the USDA Animal Welfare Act (PHS Policy), and other Federal statutes and regulations relating to experiments involving animals. The facility where this research was conducted is accredited by the Association for Assessment and Accreditation of Laboratory Animal Care International and all animal work adheres to the conditions specified in the Guide for the Care and Use of Laboratory Animals (National Research Council, ). These experiments and procedures were approved by the USAMRIID Animal Care and Use Committee (IACUC). Animals were given enrichment regularly as recommended by the Guide for the Care and Use of Laboratory Animals. The animals were fed and checked at least daily according to the protocol. All efforts were made to minimize painful procedures; the attending veterinarian was consulted regarding painful procedures, and animals were anesthetized prior to phlebotomy. Following the development of clinical signs, animals were checked multiple times daily. When clinical observations and scores reached defined levels based on the approved IACUC Animal Care and Use Committee protocol, the animals were euthanized under anesthesia to minimize pain and distress. For this study, seven adult male and female cynomolgus macaques (Macaca fascicularis), ranging in weight from 5.5 to 8.7 kg were obtained from licensed and approved vendors. During the acclimation to the biosafety level 4 (BSL4) containment suite, a pre-challenge blood sample (8 days before exposure) was collected to provide a baseline for further analyses. (These samples are referred to in this manuscript as pre-infection or 0 days post-infection samples.) On day 0, NHPs were anesthetized and minute volumes calculated by performing whole-body plethysmography (Buxco Research Systems, Wilmington, NC) just prior to the exposure. NHPs were exposed individually at a target dose of 1000 Plaque Forming Unit (PFU) of LASV Josiah in a head-only chamber in a class III biological safety cabinet maintained under negative pressure within a BSL-4 laboratory. Aerosols were created by a 3-jet Collison nebulizer (BGI Inc., Waltham, MA) and controlled by the USAMRIID Automated Bioaerosol Exposure System (ABES-II). The virus preparation used to infect NHPs was free of contamination of endotoxin and mycoplasma. After challenge, blood samples were collected at various days post-infection (dpi), based on approved collection allowances, as well as at euthanasia. Groups of two to three NHP were euthanized at 3, 6, 8 and 10 dpi, and peripheral blood mononuclear cells (PBMCs) were prepared from collected blood. 1) The virus strain used was MARV Angola, 2) the number of adult male and female macaques was nine, and 3) macaques were euthanized and PBMCs collected from blood at 1, 3, 5, 7 and 9 dpi. PBMCs were isolated from blood pre-diluted with saline using ACCUSPIN System-Histopaque-1077 tubes as per manufacturer’s recommendations, and subsequently lysed in TRI Reagent LS (Sigma-Aldrich, St. Louis, MO) at USAMRIID. A subset of the total RNA samples from both datasets was processed for RNA sequencing (Figure 1A). Sequencing libraries were prepared for mRNA sequencing using TruSeq v2 RNA Sample Preparation kits (Illumina, San Diego, CA). Briefly, per the manufacturer protocol, mRNA was purified from approximately 500 ng to 1 μg of total RNA per sample using poly-T oligo-attached magnetic beads, then fragmented and primed with random hexamers for cDNA synthesis. Multiple indexing adapters were ligated to the ends of the double-stranded cDNA, and the DNA fragments with adapter molecules on both ends were then selectively PCR enriched to create the sequencing libraries. Libraries were validated for size and purity on an Agilent 2100 Bioanalyzer using the DNA-1000 chip (Agilent Technologies, Santa Clara, CA) before they were normalized and pooled for multiplex sequencing. Cluster generation and sequencing were performed by the Analytical Core Facility at Tufts University (Department of Physiology). After sequencing the Macaca fascicularis PBMC RNA samples from both types of infection (Lassa and Marburg), the generated reads were trimmed and the adapters were removed using Trimmomatic . The processed reads were aligned to the Macaca mulatta genome (Ensembl release 75) using TopHat 2.0.6  with default parameters (segment length of 25, allowing up to 2 segment mismatches) and using the RhesusBase2  annotated M. mulatta transcriptome as reference. Gene counts were obtained using HTSeq  to count reads that aligned uniquely to each gene. Counts were normalized to compensate for differences in library size using the trimmed mean of M-values normalization method  included in the edgeR BioConductor package . The normalized sequenced reads were also aligned to the Lassa virus (NCBI BioProject accession PRJNA14864) and Marburg virus (NCBI BioProject accession PRJNA15199) genomes using BWA  to quantify the number of viral reads in each sample. A gene was deemed to show statistically significant changes in expression at a specific time after infection if the moderated t-test  between the infected and pre-infection samples resulted in a multiple testing-corrected p-value lower than 0.05, with an absolute fold change in expression greater or equal to 3, and an average number of reads across all samples greater than 4 counts per million (CPM). When calculating relative changes to the pre-infection samples, infected samples were not subtracted from their individual uninfected controls (since not every infected sample had a pre-infected control), but from an average of all the pre-infection samples. Statistical significance, however, was calculated using the individual pre-infection samples, not their average. PBMCs were processed for microarray analysis as described previously . Briefly, total RNA was extracted from the TRI Reagent LS samples, then amplified using the Low-Input Quick Amp Labeling kit (Agilent Technologies, Santa Clara, CA) and hybridized to Whole Human Genome Oligo Microarrays (Agilent Technologies, Santa Clara, CA) in a 2-color comparative format along with a reference pool of messenger RNA. Images were scanned using the Agilent High-Resolution Microarray Scanner and raw microarray images were processed using Agilent’s Feature Extraction software. Agilent two-color human gene expression microarrays were processed using limma . Fold changes were obtained by calculating the log-ratio between the intensities of the red channel (which corresponds to experimental samples) and the green channel (which corresponds to Human Universal Reference RNA ). These were later background-corrected and normalized using LOESS . The limma  implementation of Multidimensional Scaling was used to reduce the dimensionality of a matrix composed of the expression values of the following 16 genes across the 66 RNA samples: MX1, OAS1, IFI44L, CXCL10, HSPA1B, IGJ, HSPA1L, BIRC3, SIGLEC1, TNK2, TNFSF10, NR4A2. RT-PCR reactions were carried out in 50 μL reactions using Power SYBR® Green RNA-to-CT™ 1-Step Kit from Life Technologies: 25 μL SYBR® Green RT-PCR Mix, 2 μL of each primer at 100 μM, and .4 μL RT Enzyme Mix. Thermal cycling was conducted as follows: 30 minutes at 48°C, 10 minutes at 95°C, 15 seconds at 95°C (40 cycles), and 1 minute at 60°C (40 cycles). The primer sequences used were: SIGLEC1 (FWD) 5′-TCCTGAGTGTACTCTATCCC-3′ (REV) 5′-TCGACAGTGCAGACAAAC-3′; BIRC3 (FWD) 5′-ACTTGAACAGCTGCTATCT-3′ (REV) 5′-TCTTCTGAATGGTCTTCTCC-3′; BIN2 (FWD) 5′-CTCCTGAGGCCAAAGAAA-3′ (REV) 5′-AGGCTCTGAAGCAATCTG-3′. BIN2 was chosen as the control gene because sequencing analysis showed it was highly expressed across all samples and had a small relative standard deviation. The sequencing data sets supporting the results of this article are available in the Sequence Read Archive (SRA) under accession numbers PRJNA222891 (Lassa) and PRJNA222892 (Marburg). The microarray datasets are available in the Gene Expression Omnibus (GEO) database, under series record GSE41752 (LASV)  and GSE58287 (MARV) [Lee et al., manuscript in preparation]. This work was supported by the National Institutes of Health grant R01 AI1096159, and the United States Army contracts W81XWH 100-02-0008 and 11-02-0130. ISC was supported by the Fulbright Commission Spain and the Regional Government of Andalusia. The funders had no role in study design, data collection and analysis, decision to publish, or preparation of the manuscript. The authors declare that they have no competing financial interests. JHC and ISC are co-inventors on a patent application relating to the results described herein. Conceived and designed the experiments: ISG, JYY, JHC. Performed the experiments: JYY ISG. Analyzed the data: ISG. Contributed reagents/materials/analysis tools: Lisa Hensley, Arthur Goff, Anna Honko. Wrote the paper: ISG JHC JYY. All authors read and approved the final manuscript.